Since the new year, I’ve been staying out of the garage and working in my sewing room. I am drawn to doing work in the garage, but the temperatures have been hovering just above the freezing point and kerosene heater or no, it is too damned cold to be working outside. And not just for me, but for painting and staining. 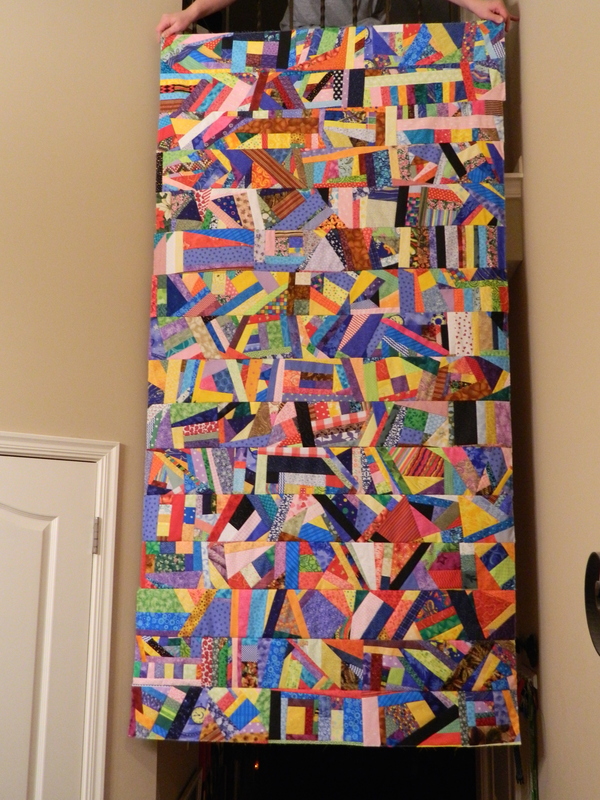 I am an avid quilter. Rather, I make a lot of the quilt tops and send them off to be quilted and then returned to me and then I bind them (the outer edge). 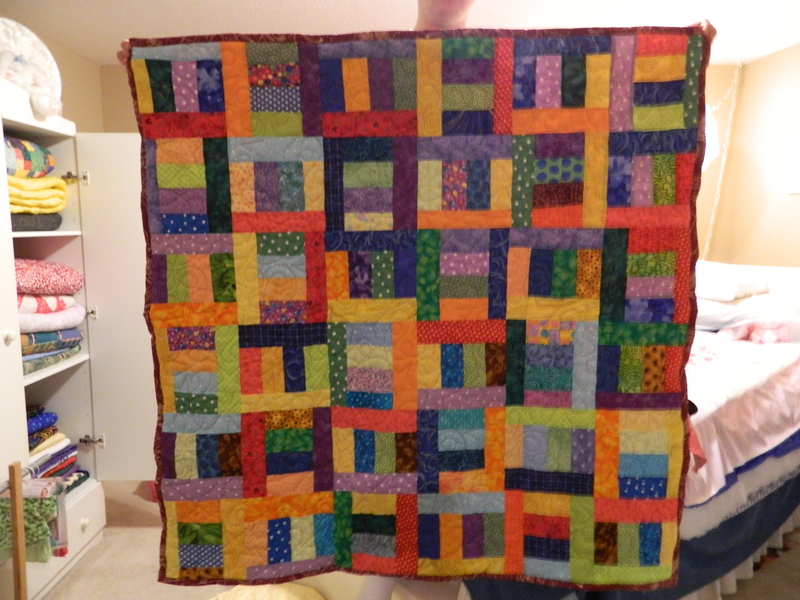 I’ve been quilting for over almost 15 years, started just before 2000 and I am betting in the time I have made at least a five hundred (or more!) quilts. In the last couple of months, I received two big boxes of quilted tops from my friend Gloria and I’ve slowly been working through them. Doing the binding, that is. I’ve created some of these quilt tops months – even as long as years – ago. I have almost forgotten that I’ve done some of these. 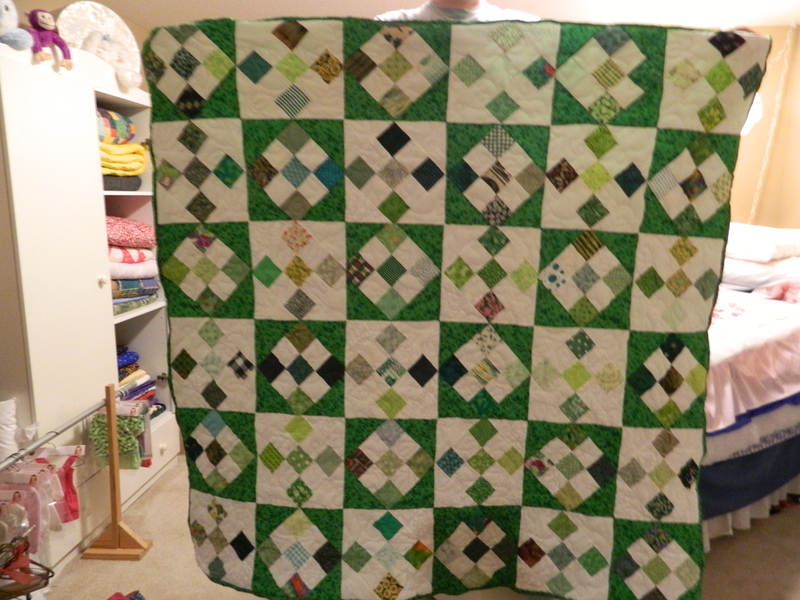 This was a work in green… not much to say about it really, just a nice fun pattern that I will give to someone who likes green. This was inspired by a fun little duck print. Wouldn’t this be grand for some little one? The yellows are so cheery. 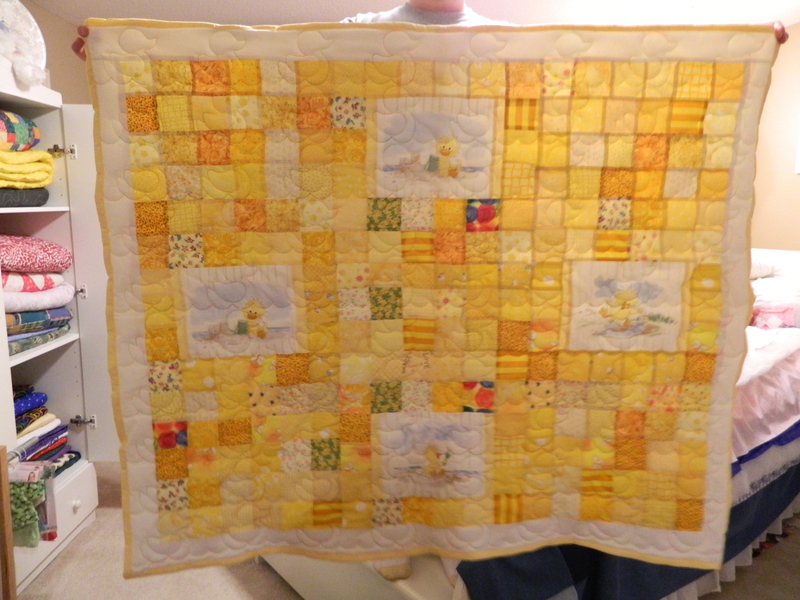 And the quilting pattern is little ducks too! Did I mention that one thing I had always loved about my friend Gloria who does the quilting, she makes most of the decisions about pattern and thread color? I like to work with her, it is a real creative collaboration. It started out with her wanting to try new patterns and me wanting to not have to choose! And it has worked out well for the last decade and a half. I love bold, strong colors. As a result, I also end up with a lot of great scraps (see below). Sometimes I just like to sit and cut pieces while watching old movies on DVDs (I have the complete set of Alfred Hitchcock’s movies) and then sit and sew them together. Sometimes they turn out absolutely great and sometimes they turn out ok. Once in a great while I get a dud or two, to which those are donated to the local no-kill animal shelter for the dogs to use. That way, it gets used and the puppies probably don’t care what it looks like! This is a piece that I have been working on and off for years! These are strips of white cotton are cut across the width of the fabric and six inches wide. Then the strips and scraps are sewed onto them. 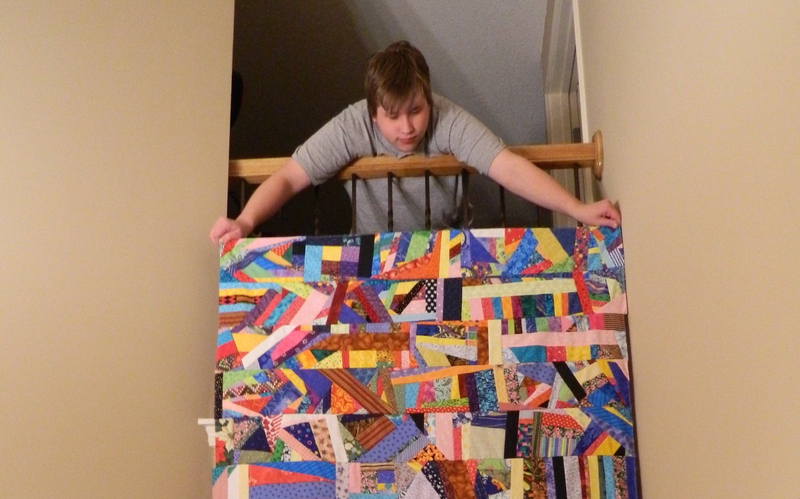 I had 16 strips completed, so I then sewed them together. The back is just white cotton and I am debating about whether or not to layer it and quilt it or just leave it as is. I have it hanging over the landing railing, so every time I walk down the hall, I see it. And then I think about it. The guest bedroom bed has about another nine or ten quilts waiting to be bound. And of course I have projects that I’ve started that need to be completed. And I found another box of quilt tops that I need to send off to be quilted. But Gloria has decided to hang it all up and retire and now I have to find someone new. This is gonna be difficult!